We have recently acquired a magnetic viewer in order to aid our digitisation work. 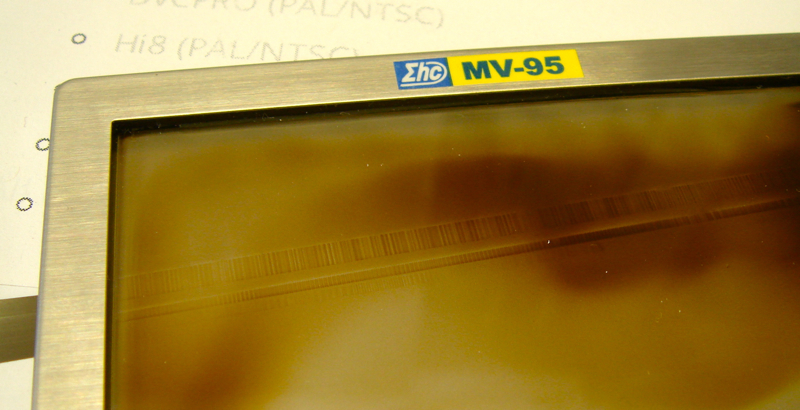 By pressing the viewer against the tape we are able to read the magnetic information recorded on it. The reader helps us to visually identify the position of the recorded tracks on the tape, and enables accurate playback during digitisation. Magnetic readers can also help us to identify potential problems with the tape, for example if a track has been partially erased, because it will show up on the viewer. We receive tapes that are in varying states of repair and disrepair. Sometimes the person who made the recording kept the tapes in impeccable, temperature controlled conditions. Inscribed on the boxes are dates and lists of who performed, and what instrument they played. The tapes often feature detailed notes about the number of tracks recorded, whether they are in stereo or mono and if they used noise reduction technology. Digitisation, in such cases, does not usually pose great challenges. At the other extreme are tapes recorded by people who never wrote anything down about how they made their recording. This means the people doing the digitising can be left to do a lot of guess work (particularly if that person has since died, and can’t tell you anything about the recording). A lack of informative metadata about the tape does not necessarily create migration difficulties: recordings can be very straightforward like, for example, a ½ track stereo recording of a single voice. It is essential that the appropriate head is used to read the magnetic information recorded onto the tape. Problems can however arise when recordings have been made in an idiosyncratic (and inconsistent) manner. For example (and in exceptional circumstances) we receive single magnetic tapes that have a mixture of track formats on them which include four track multi-track, ½ and ¼ track mono and ½ and ¼ track stereo. In such cases it can be hard to discern the precise nature of the recordings using the ears alone. Often such recordings don’t sound ‘quite right’, even if it is not exactly clear what the problem is. Rather than relying on speculation, using the magnetic reader gives 100% confirmation about where tracks are recorded on the tape, and therefore helps us to replay the tape using the appropriate playback heads, and therefore digitise it accurately. This entry was posted on Monday, April 14th, 2014 at 2:45 pm	and is filed under Audio Tape, Video Tape. You can follow any responses to this entry through the RSS 2.0 feed. You can leave a response, or trackback from your own site.